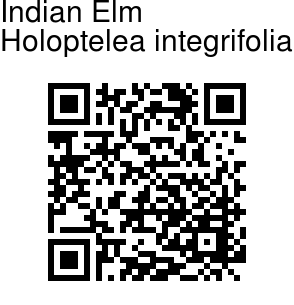 Indian Elm is a large deciduous tree, gowing up to 18 m tall. It has grey bark, covered with blisters, peeling in corky scales on old trees. Alternately arranged leaves are elliptic-ovate, 8-13 cm long and 3.2-6.3 cm wide, smooth, with entire margins, and a pointed tip. Leaf base is rounded or heart-shaped. Stipules are lance-shaped. Crushed leaves emit an unpleasant odour. Flowers are small, greenish-yellow to brownish, pubescent, borne in short racemes or fascicles at the scars of fallen leaves. Sepals are velvety, often 4. Fruit is an a circular samara, 2.5 cm in diameter, with membranous, net-veined wings, and flat seed. 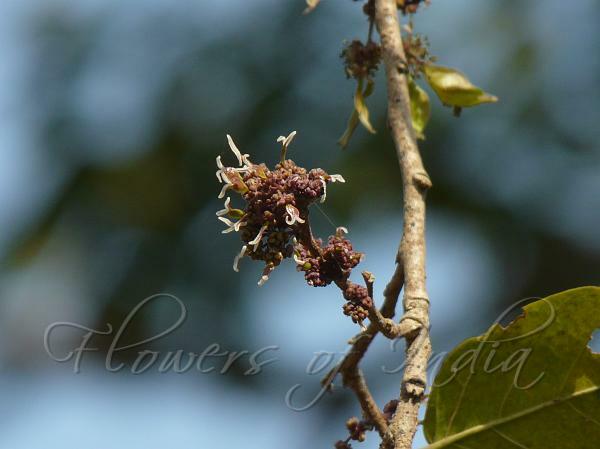 Medicinal uses: The bark of Indian Elm is used in rheumatism. Seed and paste of stem bark is used in treating ringworm. Bark and leaves are used for treating oedema, diabetes, leprosy and other skin diseases, intestinal disorders, piles and sprue.